Make the most of your stay with our guide of best places to eat and things to do in-and-around Keswick. Take a brewery tour and taste our local ales. Go deep underground with a range of mine tours. Something to suit all ages. A great day out regardless of the weather. State of the art indoor climbing wall and ice wall with kids soft and hard play areas adjacent. Great for all the family, especially on a wet day. Combine a distillery tour with lunch or afternoon tea at the excellent bistro style restaurant at The Lakes Distillery next to Bassenthwaite Lake… a great day out. What better place to entertain the kids if the weather is a little inclement. Our jewel in the crown, the lakeside theatre offers year round entertainment for every taste… not to be missed. On the shore of Derwentwater. Sailing boats, rowing boats for fishing, windsurfers, canoes, are all available for hire or with instruction. Try fishing for trout at Watendlath Tarn, an idyllic place to visit. This is a fabulous adventure experience for all ages, set in Whinlatter Forest, a ten minute drive from The House it offers thrills without spills for all ages. A challenging 18 hole course at Threlkeld. Great golf and fabulous scenery. A launch service on your doorstep just 10 minutes walk to Nichols End, pick up a launch for a scenic trip to Keswick or to any of the six stops in the Borrowdale valley. Biking is big in the Lakes, either off-road on the many trails or road bike on scenic routes. All hire options are available here. Outdoor activities and corporate events including ghyll scrambling, canyoning, rock climbing, abseiling, and white water tubing. white Water Tubing : rock climbing : abseiling . Wander around the beautiful 24 acre parkland and see over 100 species. Ten minute drive from the house, kids will love it! The Ospreys have returned for nesting for the past nine years to Bassenthwaite Lake, majestic birds flying free in a wonderful setting. Honister puts the adventure in our adventure capital. The UK’s best Via Ferrata and the thrilling Infinity Bridge make for an exhilarating experience on the fells. Biking, walking, Go Ape and miles of trails to explore. Whinlatter Forest Centre is a 10 minute drive from the house. The Keswick Tourism site is worth exploring for local events, ideas for days out, and recommendations of places to eat along with entertainment options. For the ladies and maybe the gentlemen too, experience and relax at this top class spa. A mere 15 minute drive away. The ultimate indulgence… hire a hot tub for your weekend. Pamper yourselves with in-house spa and beauty treatments. Contact Jessica on 07747764013 or email Jessicajane25@gmail.com. Indulge yourself with a relaxing therapeutic massage. Jessica offers in-house personal treatments and whilst she specialises in sports and deep tissue therapy she is trained in all aspects remedial massage. Contact Amelia Scoon on 07533832302 for further info. 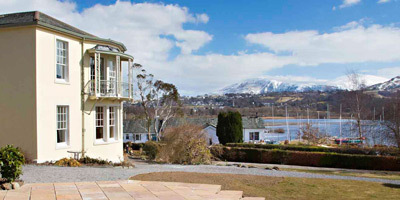 Bring together up to twenty two of your nearest and dearest in a stunning Georgian house overlooking the picturesque lake, Derwentwater. Should you wish to return to Keswick in the future as a smaller group we have superb Riverside holiday apartments accommodating 4-6 guests. Or perhaps if a little Spanish sunshine appeals our luxury self-catering villa accommodates 8 guests in great comfort.